Please note this item is made to order or is temporarily out of stock. Do not hesitate to order as the dispatch delay is relatively short (normally within 7-10 days). A Shoulder Strap is a handy thing to have when you want to keep your hands free while carrying a side-case or top case liner. Ours are made of strong black nylon webbing, adjustable in length, with sturdy hooks on both ends. 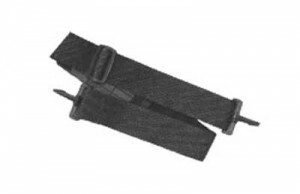 This 2" (5cm) wide strap also comes with a shoulder pad and is recommended for heavier bags. For use only with Kathy's Journey Designs bags fitted with suitable D-rings. KJD LIFETIME inner bag liner for BMW 33 litre top case: R1150RT, R1150RS, etc. KJD LIFETIME inner pannier liners for BMW R1100RT, R1150RT, R1150RS, etc. KJD LIFETIME inner pannier liners for BMW R1150GS, R1150R, K1200GT/RS, etc. KJD LIFETIME inner bag liner for BMW 49 litre top case: R1200RT, K1300GT, etc.